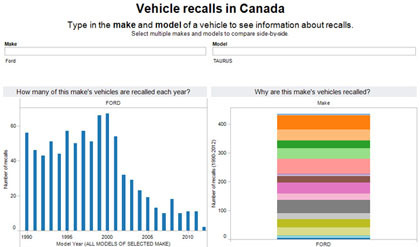 I recently put together an interactive feature that lets users explore vehicle recall data and compare recalls on different cars. The full news story is here, with a nice TV report by Global Toronto’s Sean O’Shea. The data for this is drawn from Transport Canada’s Road Safety Recalls Database, a searchable version of which is available on their website, although I had to do an Access to Information request to get the underlying data. What excited me about this project is that it’s truly interactive. What you see on the screen completely changes depending on what you type. Everyone will have a different experience because everyone will want to search and compare different vehicles. Hopefully, it’s both informative and fun. I used Tableau Public to power this feature. I’m liking this tool a lot lately because of the way you can link a variety of different visualizations together to really explore a given topic. It’s not perfect though. Tableau is powerful, but very non-intuitive to use. This project took a lot of trial and error and email exchanges with Tableau staff to put together. The Public free version also has a limit of 100,000 rows, which meant that I had to summarize my data and make it show only recalls from 1990 and later. Still, pretty fun. Last week, I also did a similar visualization (under the hood at least) on MP’s expenses. This entry was posted in Uncategorized and tagged data journalism, freedom of information, interactive, tableau. Bookmark the permalink.